If your console PS4 is no longer valid and you need to give it more storage space, get in the way of DIY (Do it Yourself) and change it yourself. Although the console comes with a mechanical hard drive that you can replace, also you can put a solid state drive (SSD) that writes and reads data much faster than conventional hard drives, also known as HDD. Regardless of which option you choose, below we guide you to learn how to change the hard disk of the PS4 step-by-step. We provide absolutely everything, you’ll see that it is very easy! Before you change the hard drive of the PS4 for a SSD drive, tested the hard drive that comes with the system by measuring the amount of time the PS4 needed to boot up on the screen when the operating system asks you to press the PS button on the controller. We tried it twice, and got times of 27 seconds and 24.9 seconds. Once we removed the hard drive from the PS4 and then do the task that we are about to carry out, we returned to perform the tests boot. We have boot times of 19.2 and 19.4 seconds with the built-in SSD. Therefore, the boot is between 5 seconds and 8 seconds faster with an SSD than with the mechanical hard drive with the delivery of the PlayStation 4. If you don’t believe that this is significant, remember that loading save games, loading levels, and other tasks will also be much faster. Over time, those seconds obtained will make your PS4 go much faster. An SSD of 2.5 inches (more than 160 GB and not more than 9.5 mm thickness). Be sure to save the game files in one of the USB sticks through the Settings menu of the PS4. From there, go to Management of the saved data of the application>saved Data in system storage>Copy to USB storage device. If you’re a subscriber of PlayStation Plus, you can also upload your saved games to the cloud, instead of in the USB memory; so you will only have to download them again once you have installed the new drive. Place the PlayStation 4 on a secure surface and pressed down on the shiny side and black on the top panel. With the front of the system facing you, slide the panel to the left. Must be removed without problems, since it does not lead screws. 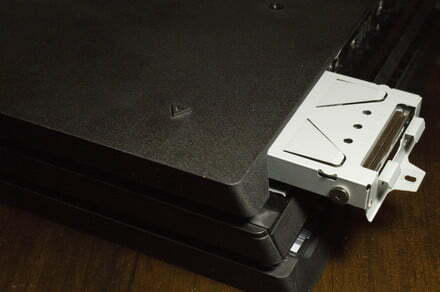 Remove the screw located in the front of the PS4, which keeps the compartment of the hard disk closed. It is easy to identify, because it leads to the same buttons-circle, X, square and triangle of the controls of the PlayStation 4. It is a phillips screw (Phillips), but you may need a screwdriver a bit smaller than usual to get it out without problems. Pulling the base of the hard drive toward you and remove the hard disk drive of the PS4. Should be taken out. Once you take out the hard disk, you will find that it is still protected by a metal box that is closed with four black screws. These screws are located on the sides of the box, there are two on each side. Bring them out with a phillips screwdriver standard. Take out the hard disk of the PS4 out of the box. Place the solid state drive 2.5 inch in the box and facing the same way as the original drive of the PS4. To give you an idea, in the picture above we put together the two, one above the other. Notice how the rear ports of each unit are exactly the same and are in the same places. Screwed the SSD into the metal box with the four black screws that pull before. Enter the box with the new hard disk into the bay the original hard disk of the PS4. Closes the compartment of the hard disk of the PS4 with the same screw that you pull to open it, using a small tip of star. Place the top panel of the PS4 back into the system. Then, connect your PS4, but don’t come back on yet. Here is where you will need the other USB memory. Using a computer, download the latest update file from the operating system, PS4 by visiting the website of Sony and then clicking on the link “Download now”. This will ensure that you get the latest version. Enter the other USB memory stick in the computer. Open it up and creates a folder in it called “PS4”. Then, open the folder PS4, and creates another folder inside of this called “UPDATE”. Once that is finished downloading the update file of the operating system PS4 (which is called PS4UPDATE.PUP), drag it to the USB memory and save it in the UPDATE folder. Remember, the UPDATE folder should be inside the folder PS4 in your USB memory key for this process to work. Eject the USB key from your computer safely and connect to one of the USB ports located on the front of the PS4. Are the same ports that you can use to connect the controller DualShock 4. Press and hold the power button on your PS4 between 7 and 10 seconds, until you hear two beeps. This will force you to boot in safe Mode. Once in the Mode menu to test failures of the PS4, select the option to “Initialize PS4 (Reinstall system software)”, that should be the seventh option from the list at the top of the screen. Your PS4 will scan the USB memory stick that you plugged in a search for the update file that you downloaded through the computer. It can take between 20 and 30 seconds, but the next screen that appears will take you through some simple instructions on how to install the operating system of the PS4 in the SSD drive that you just put in the console. This part of the process is not complicated at all. You will only have to press the X button on the controller of the PS4 several times. Once the operating system of the PS4 is installed, you will be ready to get started! All you have to do after is to copy the game files you’ve saved on your other USB drive to the new SSD drive of the PS4. To do this, connect the USB drive to your PS4, open the Settings menu of the console and go to Management of the saved data of the application> Data saved in the USB storage device>Copy to system storage.